When I was a kid, we often vacationed in Polperro, a little fishing village in Cornwall. Many of these 18th century cottages with low roofs and even lower beams were built using salvaged ship timbers. It’s not uncommon to find carvings in the timbers of the living rooms dating back to the 16th century. 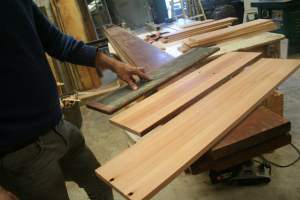 Later in my life as a young bench joiner in England, we would salvage similar timbers out of homes and barns and re-purpose them once again to make doors and cabinets. One can only imagine the stories those timbers could tell from all the lives they’ve had. Now after I’ve scraped off the multicolored chewing gum and years of varnish, I study and select the pieces for this front door. I wonder what stories it could tell. How many graduates sat here, how many basketball games lost and won, how many boyfriends/girlfriends jilted, made up, made out. Many students had their own rites of passage on these bleachers; now as I assemble the door these old planks of wood will become a new passage for a growing family.